The hands are typically the first place we start showing the signs of aging and are a dead giveaway of your age… what do your hands say about you? Over time, we lose tissue volume in our hands, veins become more prominent, tendons show and bones protrude. Even if you have a stellar skincare regimen it’s almost impossible to stop your hands from showing the signs of aging. If you find yourself reminiscing about what your hands once looked like, you’re in luck! Spa Trouvé now offers Hand Rejuvenation treatments at our Utah spas in Orem, Draper, Highland (UT County), and Salt Lake City! 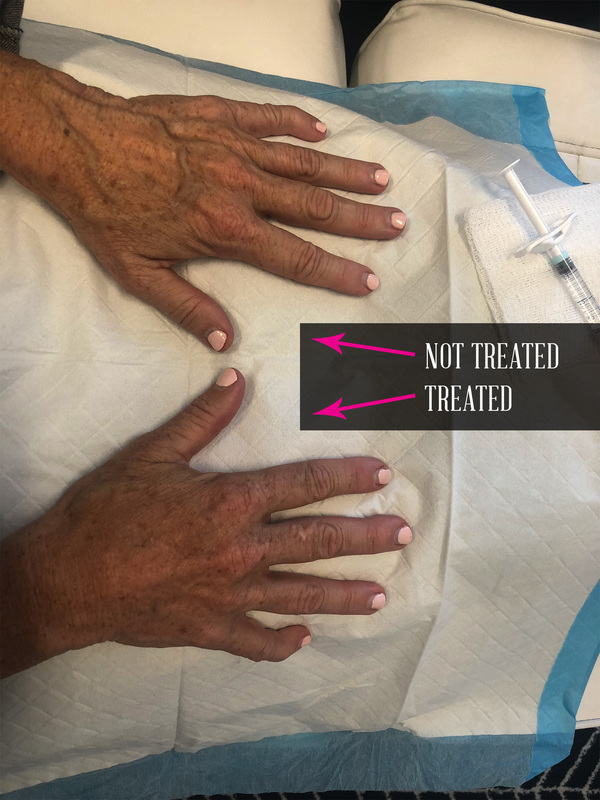 You’ve probably heard of injecting filler into the face to restore or add volume in strategic areas (commonly cheeks, lips, & under eyes), well our Utah Hand Rejuvenation treatment is basically the same thing… but for the hands! Injecting filler into the hands helps restore volume, treat wrinkles, and reduce the appearance of veins, bones and skin discolorations. Injections of Restyalne Lift anywhere from 6-12 months and our clients are loving their results! Do hand filler injections hurt? Surprisingly our clients have reported very little to no pain whatsoever during the injection process in the hands! The idea of placing a needle in the back of your hand might seem painful, but it’s much less painful than any facial filler injections .Our expert injectors will consult with you prior to injecting any filler to determine whether or not any numbing cream or agents will be needed and will check in with you throughout the treatment to be sure you are comfortable. Interested in Hand Rejuvenation treatments in Utah? Spa Trouvé is a top Utah provider Hand Rejuvenation treatments and our expert injectors are experienced and highly qualified.